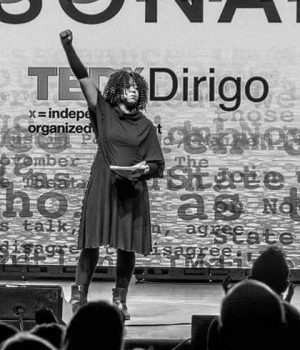 Shay Stewart-Bouley: Writer, blackgirlinmaine.com & executive director of Community Change Inc.
Racism is an uncomfortable topic of conversation for many people. It falls in line with the golden etiquette rule—never talk about religion or politics. Stewart-Bouley encourages people to become more educated about the roots of racism and the layers of systematic and structural integrity. 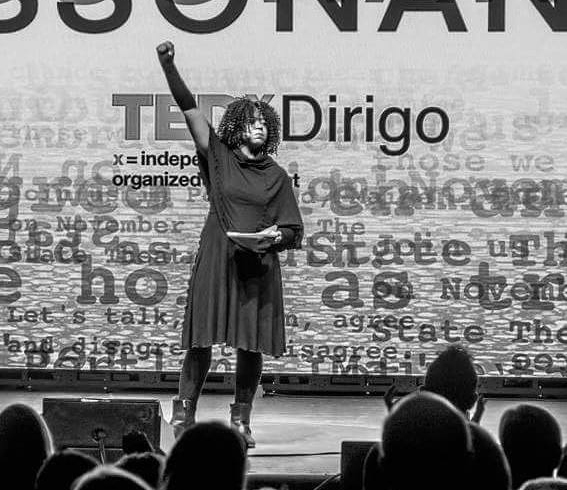 She does this every day through her work as the executive director of Community Change Inc., and through her widely read blog, Black Girl In Maine. When Stewart-Bouley launched the blog in 2008, it was during the height of “mom blogging.” The blog’s initial intent was an opportunity for Stewart-Bouley to write more without the constraints her columns for The Portland Phoenix, The Portland Press Herald and Journal Tribune imposed. “I didn’t set out to write a blog focused on race, but more about how unique my life is in Maine,” says Stewart-Bouley, who moved to one of the nation’s whitest states in 2002. She wrote about her daily life, but her work for nonprofits focused on social change provided an interesting perspective. Her focus slowly shifted to writing more about race, and today it comprises 90 percent of the blog’s content. In the past eight years, the readership of Black Girl In Maine skyrocketed. Some blog posts receive upwards of 50,000 hits, and the corresponding Twitter account (@blackgirlinmain) has 10,500 followers. While Stewart-Bouley spends 20 to 25 hours a week managing the blog’s platform, developing original content and curating share-worthy content from other sources, it is not her primary job. “Our work is not diversity. Diversity is very much a Band-Aid. We are interested in creating a framework. We did create a country with a hierarchy. How do we change that?” says Stewart-Bouley, who challenges people to educate themselves through books, local events and various programming such as offered by Community Change. “For years, [Shay] has pushed those who know her to be better people by shining her bright light,” says Jessica Esch, a Portland writer and illustrator. Esch first discovered Stewart-Bouley and her blog through Twitter. As a member of the white majority in Maine, Esch admits how easy it is to think everyone shares the same experience. However, Stewart-Bouley’s “courage to speak the truth” has forced Esch to see “an ugly side” of her home state, which in turn, helps her understand how much work needs to be done to achieve an equitable and just society. Delilah Poupore first met Stewart-Bouley when she headed up a downtown Biddeford nonprofit organization that offered free afterschool and summer activities for low-income, at-risk area youth. Early on, Poupore recognized Stewart-Bouley as an excellent role model as a nonprofit professional. Stewart-Bouley sees it not as much as bravery, but as an opportunity to spark discussion. As an executive director who works partly from home, she misses the opportunity to discuss daily happenings around the water cooler. And for those who follow Black Girl In Maine, those conversations inspire a pursuit of further education and often spur readers into action. Emma Bouthillette is a Biddeford native whose first book “Biddeford: A Brief History” will be released this spring through Arcadia Publishing. When she is not working or writing, she’s either enjoying a good book or walking Miss Savvy, her Pembroke Welsh Corgi. For more information about Emma, visit www.emmabouthillette.com.